Trust took 3 years to get here! We had this stray cat come around our house a few years ago that was obviously starving…skin and bones. Many people hate cats – especially stray cats. They try to kill them, shoot them, poison them, etc. Basically stray cats are objects of peoples’ wrath. We set food out for it and it ate it. All of it. Quickly. As this became a daily ritual I decided to see if I could touch it – it was skin and bones, but it had a beautiful coat. I leaned around the corner of our garage where we had its food and scratched the back of its neck as it ate. She pulled away for a quick second, but then she resumed eating. Her need for food overruled her perceived need for running away from this stranger who was touching her. Over time, she grew used to our scratching her neck while she ate. We were concerned that she would become pregnant – which would not be ideal for a litter of kittens in this situation. Since she would never let us touch if she was not eating, let alone pick her up, we trapped her. We took her to a veterinarian who did charity “fixes” on stray cats. We were too late – she was “with kittens.” The doc took the kittens, and then de-wormed her, de-fleaed her, and then, interestingly, when the vet was done, he clipped one of her ears as a sign to Animal Control that it was a stray cat who had been fixed so that they would not pick “her strayness” up to euthanize her. We decided that after all of this effort, we would take her home and let her become our second “indoor cat.” We called her momma kitty. This is because the other kitty we had at home was still a kitten – dropped off at our front door. Momma kitty, though she had no kittens, would still lactate for a while. Oddly enough, they became “mother and daughter” and younger kitty actually nursed from momma kitty. Funny how God even cares for and meets the needs of two cats! I was curious to know if she would ever warm up to us. My first few attempts to try to pet her were met with rejection. I did not want to scare her, so I just left her be. The day came when she rubbed against my leg like cats do. I reached down to scratch her neck like the old days, and she let me. Progress! I could not, however, pick her up as her claws would dig in and she would be gone! She really liked being scratched behind the neck. She especially liked when I scratched her clipped ear. It seemed almost euphoric to her. If I ignored her when she rubbed against my legs for her daily scratch, she would meow. After several weeks, I tried something. I totally ignored her. After several minutes of her trying to get my attention, she jumped on the edge of the couch next to me to meow. I looked at her and told (as if she could understand me!) “Look, if you want me to scratch your neck, then I want some reciprocity!” She actually walked over to my lap and let me scratch her neck while on my lap. That was over two years ago. Now it is a daily routine where I come home, sit in the easy chair, and she jumps up on my lap and I scratch her neck, her ears, and then she rolls over and I scratch her belly. She lets me hold her and even turn her upside down like holding a baby – but she can only take that for so long! Amazing how far her trust has come – but it has taken 3-4 years! God is like that too. He doesn’t rush us. He is patient. His grace is awesome! His grace has two parts. 1) the transfer part, and 2) the transform part. He has transferred us from the kingdom of darkness where we were, by nature, objects of wrath just like momma kitty was before she came to our house. In the kingdom of darkness, things were not going so well for us…. To be clear, we were not objects of God’s wrath, we were objects of Satan’s wrath. The author of abuse was loving what he was doing to us! Now the second part of grace is the transformational part. This is the part we tend to not like. Change takes work. We are used to our habits! Our depression was familiar to us! Our anger was a nice fixture on our walls! Living in the shadows was fun! Nobody told us what to do! (Really?) But God loves us too much to leave us that way! We are transformed from what the world wanted us to be, to what God created and redeemed us to be. Our job is to work that transformational grace out into all parts of our lives. Go in His transformational grace this day! Stop being an object of wrath, and join a new Kingdom! If you would like to know how, just contact me! 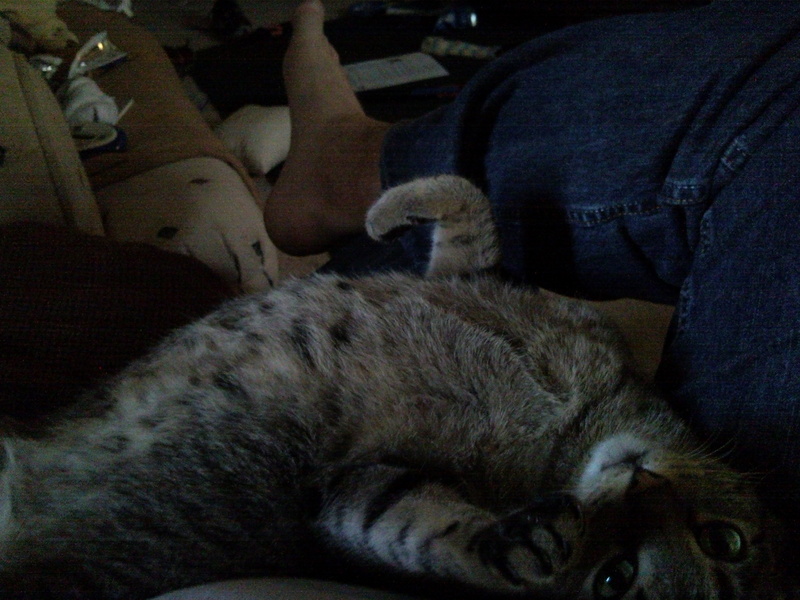 Posted on August 31, 2011, in Momma Kitty, Uncategorized and tagged Momma Kitty. Bookmark the permalink. Leave a comment.